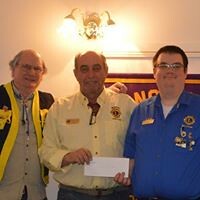 The Westport Lions Club was honoured recently by a visit from Past District Governor, Lion Ted Hughes and Zone Chairman, Lion Fred Wilson. Lion Wilson addressed the meeting and his inspirational message was well received and very uplifting. 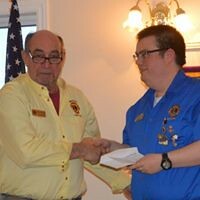 He outlined ways in which a Club and individual members can better serve their communities and have a more active group. It was encouraging to have Treasurer Lion Bob Weir report that all Club accounts are in the black. All members have received tickets for the Spring Draw fundraiser and they are selling well. Convenor, Lion Don Baker, urged everyone to help make this event its’ usual success. 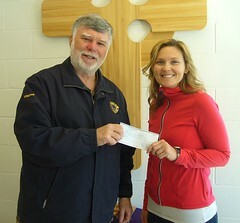 The draw will be held on May 25, with proceeds going toward Lions Club activities in the community. Locally, Convenor Lion Don Baker and Club members are offering an opportunity to purchase tickets for the May 25 draw. First prize is $1,500 in cash; second prize $250; third prize $150 cash. Tickets are available from every Lion member and at Murphy’s Sport Shop. The ongoing collection, “pennies for puppies”, headed up by Lion Bill Dixon of Perth is going well and a large amount has been collected by members and will be forwarded to the Training Program at Oakville, Ontario. Added to the great contribution made by “seeing and hearing” guide dogs, these specially trained dogs help someone with other disabilities to live a more normal life. This training period is costly and all funds collected will be put to good use. To have more information call toll free 1-800-768-3030. The club voted to donate the 50/50 draw funds from next month’s steak barbecue will all be donated to Pennies for Puppies fundraising campaign. There is a busy schedule ahead for Club members as they have received invitations to join neighbouring Clubs at special events. 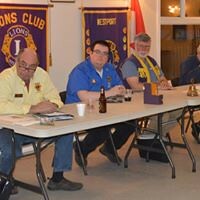 These include, a Lions Pork roast May 18, at Cape Vincent; a view of the Tall Ships appearance in Brockville on June 14-16 hosted by their Lions Club and as well, a barbecue there June 14-15-16 hosted by Brockville Club, also a Rib Fest by the Gananoque Club in July and in November, the Charter Night of Perth Lions Club. Also the metal recycling site at 245 Mountain Rd., will be open by appointment for drop off every Wednesday and Saturday 8 a.m.-5 p.m., call 613-273-2721. The Club’s annual $10,000 draw will be held on August 31, the Saturday night of Labour Day weekend.